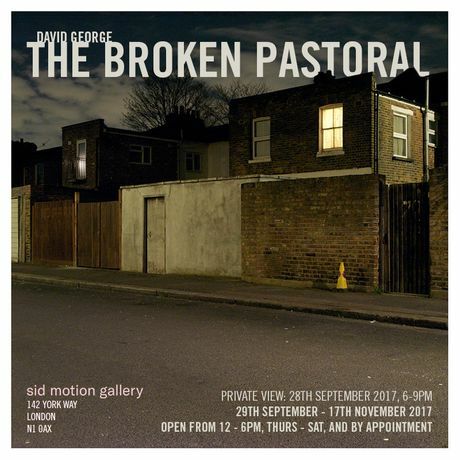 Sid Motion Gallery is pleased to present the solo exhibition, The Broken Pastoral, by British photographer David George. This body of work, all photographs shot at night with little or no additional light provided by the artist, is connected by two stands of thought and practice. The first is the transposing of themes of western classical art - ideas of the sublime, romantic, uncanny and melancholic - onto contemporary British landscape photography. The second strand aims to document these newly man-altered landscapes with a more nostalgic representation. Because of their intentional inclusion of nostalgia and romanticism, the photographs exhibited here are a distinctively British cultural response to the accelerating industrialisation and technological advances that have affected the English landscape over the past century and a half. Although the exhibition’s title, ‘The Broken Pastoral’, refers to a longing for a return to a bygone era it is not intended as a lament for something lost, but more a celebration of what has been created, and the interventions that have replaced the old pastoral vistas – the creation of a new era in English landscape.